This book is concerned with the topical problems of mechanics of advanced composite materials whose mechanical properties are controlled by high-strength and high-stiffness continuous fibers embedded in polymeric, metal, or ceramic matrix. Although the idea of combining two or more components to produce materials with controlled properties has been known and used from time immemorial, modern composites were only developed several decades ago and have now found intensive application in different fields of engineering, particularly in aerospace structures for which high strength-to-weight and stiffness-to-weight ratios are required. There already exist numerous publications that cover anisotropic elasticity, mechanics of composite materials, design, analysis, fabrication, and application of composite structures but the difference between this book and the existing ones is that this is of a more specific nature. It covers specific features of material behaviour such as nonlinear elasticity, plasticity, creep, and structural nonlinearity and discusses in detail the problems of material micro- and macro-mechanics that are only slightly touched in existing books, e.g. stress diffusion in a unidirectional material with broken fibers, physical and statistical aspects of fiber strength, coupling effects in anisotropic and laminated materials, etc. The authors are designers of composite structures who were involved in practically all the main Soviet and then Russian projects in composite technology, and the permission of the Russian Composite Center - Central Institute of Special Machinery (CRISM) to use in this book the pictures of structures developed and fabricated in CRISM as part of the joint research and design project is much appreciated. 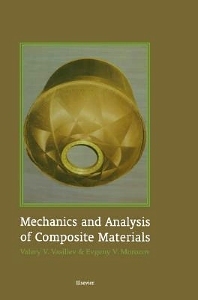 Mechanics and Analysis of Composite Materials consists of eight chapters progressively covering all structural levels of composite materials from their components through elementary plies and layers to laminates. For researchers and specialists in mechanical engineering involved with and interested in composite technology, and design and analysis of composite structures; also for engineering graduate students as a reference text. Introduction. Structural Materials. Composite Materials. Fibers for Advanced Composites. Matrix materials. Processing. References. Fundamentals of Mechanics of Solids. Stresses. Equilibrium Equations. Stress Transformation. Principal Stresses. Displacements and Strains. Transformation of Small Strains. Compatibility Equations. Admissible Static and Kinematic Fields. Constitutive Equations for an Elastic Solid. Formulations of the Problem. Variational Principles. Principle of minimum total potential energy. Principle of minimum strain energy. Mixed variational principles. References Mechanics of a Unidirectional Ply. Ply Architecture. Fiber-Matrix Interaction. Theoretical and actual strength. Statistical aspects of fiber strength. Stress diffusion in fibers interacting through the matrix. Fracture toughness. Micromechanics of a Ply. Mechanical Properties of a Ply under Tension, Shear, and Compression. Longitudinal tension. Transverse tension. In-plane shear. Longitudinal compression. Transverse compression. Hybrid Composites. Phenomenological Homogeneous Model of a Ply. References. Mechanics of a Composite Layer. Isotropic Layer. Linear elastic model. Nonlinear models. Unidirectional Orthotropic Layer. Linear elastic model. Nonlinear models. Unidirectional Anisotropic Layer. Linear elastic model. Nonlinear models. Orthogonally Reinforced Orthotropic Layer. Linear elastic model. Nonlinear models. Angle-Ply Orthotropic Layer. Linear elastic model. Nonlinear models. Free-edge effects. Fabric Layers. Lattice Layer. Spatially Reinforced Layers and Bulk Materials. References Mechanics of Laminates. Failure Criteria and Strength of Laminates. Environmental, Special Loading, and Manufacturing Effects. Optimal Composite Structures.. Optimal Fibrous Structures. Composite Laminates of Uniform Strength. Application to Pressure Vessels. References. V.V. Vasiliev became a Titled Professor in 1973, was elected as a corresponding member of the USSR Academy of Sciences in 1984 and as a full member of Russian Academy of Sciences in 2016. He worked as an engineer of the Central Aero-Hydrodynamic Institute (61-62), senior researcher and associate professor of Moscow Aviation Institute (63-72), professor of Moscow Institute of Civil Aviation Engineering (72-73) and the Head of the Department of Aerospace Composite Structures of the Moscow State University of Aviation Technology (74-98). Since 1971, he has been the General Scientific Consultant of Central Research Institute of Special Machinery and since 2012 – the chief science researcher of the Institute for Problems in Mechanics of the Russian Academy Sciences. In 1984 and 2001 he was awarded with the USSR State Prize and RF Government Prize for application of composite materials in aerospace structures. Professor Vasiliev is an author or co-author of 17 monographs, textbooks, handbooks, and design guides in mechanics of thin-walled and composite structures. Professor Morozov has more than 35 years practical and research experience in the field of composite technology. He co-authored five books and published more than 200 papers on mechanics and analysis of composite materials and structures. He became a Full Professor of Aerospace Composite Structures, Moscow State University of Aviation Technology in 1991. In 1995, he joined the School of Mechanical Engineering, University of Natal, South Africa as the Professor of Manufacturing Systems. In 2007, he joined University of New South Wales (UNSW), Canberra, Australia as the Professor of Mechanical and Aerospace Engineering. He is a Member of the Editorial Boards of Composite Structures (International Journal), Elsevier; the International Journal of Engineered Fibers and Fabrics (JEFF), INDA, TAPPI, The Fiber Society; Member of the Editorial Advisory Board of the International Journal “Curved and Layered Structures”, De Gruyter.